Among all these voices demanding change in Nigeria, the loudest remains that of Nnamdi Kanu and IPOB. They have been killed for their quest for Biafra. They have matched one million men on the streets to demand a better Nigeria, a better Africa. They have chosen civil disobedience as their weapon, and that has gained them recognition among the international community. Their ideology of a free Biafran state, would return Nigeria back to the drawing board and avert the impending doom. History will recall that the people of the old eastern Nigeria, were killed in their thousands in 1966, after a coup and a counter-coup. The majority of them were from the Igbo tribe. These mass killings convinced the Igbo that they were not wanted in Nigeria. The war which started in 1967, lasted for three years and ended in 1970. The war till today remains one of the greatest accounts of genocide in Africa. After the war, the Igbo continued to be subjugated, economically, politically and otherwise. But the majority of the Igbo concealed their war scars and integrated back into Nigeria. One could say that they suffered in silence. They suffered a lack of infrastructural development among many other things. After over 50years after the war, nothing had really changed for them. If you put aside their sheer will to be successful, their region would actually still look poor and backward. But the Igbo and their brothers went to work to build wealth for themselves again. History records that those who had their money in Niara were given only 20 pounds by the Nigerian government, no matter how large your savings were. After the war ended, Nigeria went from one Military regime to the other. And out of fear and “defeat syndrome,” the Igbo never spoke of Biafra again. But in 1999, the quest for a new Biafran state was started by a man called Uwazurike. His group was called MASSOB. He protested the continuous killing of Igbo in the North. Uwazurike agitation has died down considerably. And that is a topic for another day. The agitation for Biafra by IPOB and majority of the Igbo reached a boiling point on September 14, 2017. 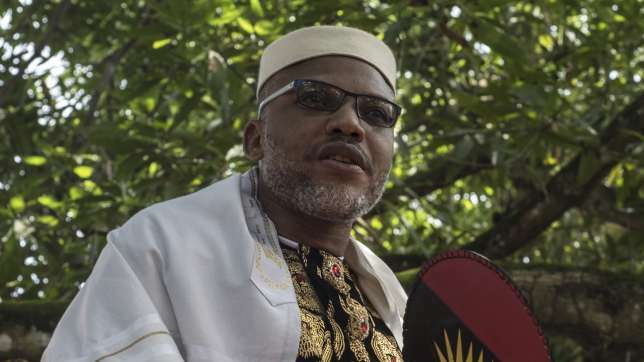 On that day, the Nigerian armed forces attacked Nnamdi Kanu in his father’s compound, in Afaraukwu, Abia state. After what seemed like the allied forces invading Germany, the soldiers failed in their attempt to silence him. It was reported that many of his followers lost their lives while defending his home. Others lost their lives as a result of a clampdown by the armed forces. This show of force was called the python dance. When you look closely at Nigeria, from a non-sentimental point of view, one would agree that things are falling apart. A country that once held so much promise is now the object of laughter. A country which calls herself the giant of Africa currently has over 16,300 of its citizens suffering in prisons in other countries. In May 2017, it was reported that 10,000 Nigerians died while crossing the Mediterranean Sea and deserts. They died running away from Nigeria – a country that was meant to take care of their social and economic needs. Nigeria can be said to be a shadow of its former self, though that glory was short-lived. There now exists a clear leadership failure and carelessness. And the worst is that this carelessness has become a habit. The people don’t trust their leaders and the leaders don’t care. The constitution is a sham and does not seek justice for all component parts of Nigeria. Crude oil is drawn from the Southern part and used to generate revenue for the government. But the very place that this crude oil is gotten from is abandoned. Research shows that the Niger Delta has some of the worst slums in Southern Nigeria. How do you expect the militants not to rise and demand their rights? It then seems like, without force or violence, the political elite will never listen to the people. Many Nigerians are tired of the status quo. They are demanding that the constitution is reviewed and the country restructured. The Igbo on the other hand, together with IPOB, led by Nnamdi Kanu, is asking that Nigeria grant them independence. The Yoruba are saying that if the Igbo leave Nigeria, that they too would leave for their Oduduwa Republic. It seems as though it is only the Hausa-Fulani that loves Nigeria as it is presently run. Among all these voices demanding change in Nigeria, the loudest, remains that of Nnamdi Kanu and IPOB. They have been killed for their quest for Biafra. IPOB have matched one million men on the streets to demand a better Nigeria, a better Africa. They have chosen civil disobedience as their weapon, and that has gained recognition among the international community. Their ideology of a free Biafran state, would return Nigeria back to the drawing board and avert the impending doom. It is believed that Nigeria can only get better if the regions are returned to what they were at independence. Or better still made independent nations. And right now, nobody has a clear-cut strategy to that division like Nnamdi Kanu. Nobody preaches that gospel more than Nnamdi Kanu.